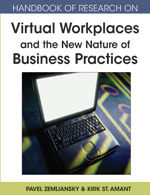 Despite a sizable body of literature on virtual organization, little attention has been paid to defining organizational virtuality and identifying factors that influence degree of virtuality in organizations. Based on virtual organization literature and the knowledge-based view of the firm, we develop a working definition of organizational virtuality. We do this by conducting a review of existing definitions of a virtual organization, and identify organizational knowledge-related factors that influence virtuality. More specifically, we propose that 1) an organization’s need for knowledge exchange and ability to exchange knowledge jointly determine the level of organizational virtuality that develops in the firm; and 2) the higher the need for and ability to engage in knowledge exchange, the higher this level of resulting organizational virtuality. The contribution that this research makes to academia and managerial practice are also discussed. Knowledge Sharing: Sharing of knowledge among multiple entities to cater to the critical issues of organizational adaptation, survival, and competence in face of increasingly discontinuous environmental change. Knowledge Exchange: Exchange of knowledge between multiple individuals, multiple organizations, or between individuals and organizations. Organizational Virtuality: The capability of an organization to connect geographically dispersed entities to continuously work together by taking recourse to information system resources. Knowledge: Justified belief for effective action. Information and Communication Technologies: Any information technologies that enable individuals and groups to communicate, coordinate, and process information, with particular focus on those that facilitate dispersed interaction across time and/or space; Examples include computers, networks, routers, software applications such as e-mail, office applications, and enterprise applications such as accounting information systems, point of sales systems, and so forth. The Knowledge-Based View of the Firm: A firm’s knowledge is not only valuable, rare, inimitable and non-substitutable, but also strategically the most significant resource available to it. Virtual Organization: A collection of geographically/temporally dispersed, functionally and/or culturally diverse entities that work together using information technology. Virtual Work: A particular work arrangement where individuals work outside of traditional centralized offices (e.g., from home or “on the road”) and operate remotely from each other and from their managers.